The Shiv Sena have taken up the Baahubali jibe to push the Maharashtra government to take a firm stand in the Belgaum issue. 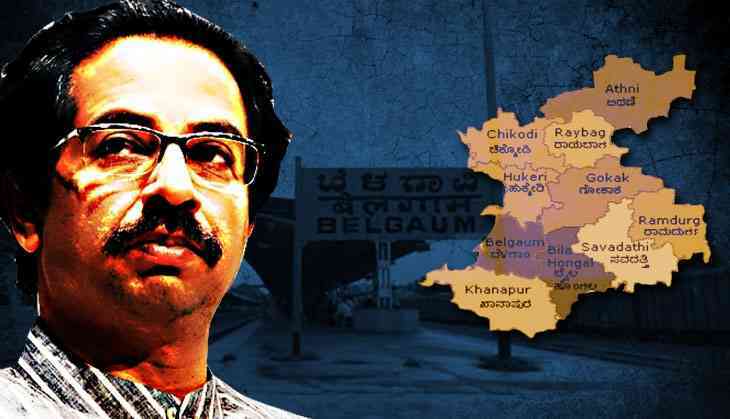 The alleged atrocities on the Marathi-speaking population of Belagavi, erstwhile Belgaum, district of Karnataka (bordering Maharashtra), has always been close to the hearts of the Shiv Sena leaders. They have expressed the 'need' of merging the district with Maharashtra ever since the state was formed and have never concealed their feelings it. The Shiv Sena also do not waste a single opportunity to blow things out of proportion. Like many other political parties, the Sena is using movie dialogues to drive their point home. And the hit of the season is Baahubali. The Karnataka government's gag order on the 'Jai Maharashtra' slogan in Belagavi City Corporation, where a majority of the members including the mayor, are Marathi speakers, has once again prompted the Shiv Sena to jump in. They are demanding the Maharashtra government take strong action in the case. During the special GST session of the Maharashtra Legislative Assembly, Shiv Sena Executive President Uddhav Thackeray dared Chief Minister Devendra Fadnavis to show his 'Baahubali' strength to the Karnataka government and get the gag order revoked. Thackeray also said that if nothing was done about this, the Shiv Sena would handle it in their style. But that was not the only instance when Baahubali was brought up in the session. During the GST debate Nationalist Congress Party (NCP) MLA Jayant Patil referred to senior BJP leader Eknath Khadse's gesture of welcoming the Kisan Sangharsh Yatra, which was taken out by the Congress and the NCP, and called Khadse the Baahubali of BJP. Responding to the jibe, Fadnavis took the matter in a lighter vein when during the speech he got a slip with a question – 'Who killed Baahubali?'. “This must have been sent by Jayant Patil, I am ready to take him to watch the movie so that he comes to know who killed Baahubali,” Fadnavis said. While the entire House enjoyed this light confrontation, Shiv Sena leader seems to have taken it seriously. In the editorial of party mouthpiece Saamna, Thackeray dared Fadnavis to show some strength to Karnataka, instead of flexing muscles at opposition leaders in the Assembly. “These days, politicians in Maharashtra have suddenly become quiet interested in Baahubali and Katappa. CM Fadnavis too is very enthusiastic to take his political opponents to watch the movie. He can happily take the opposition leaders to the movie. We request the CM with folded hands, before that, to show the trailer at least to the Karnataka government for the assault on Marathi pride at Belgaum,” the editorial says. The Karnataka government is unleashing atrocities on Marathi-speaking people of Belgaum and Marathi politicians are surrendering to it, the editorial rued. “The Government of Maharashtra should intervene and stop the suppression of Marathi-speaking people in Karnataka,” it added. Fadnavis may consult a legal advisor and will write a letter to his counterpart in Karnataka. “Mere strong words would not end the atrocities. CM Fanavis needs to take some action. Chandrakant Patil, who has been given the responsibility of the border issue and the problems faced by Marathi-speaking people in Karnataka, should now immediately go to Belgaum and meet the people, console them,” the editorial says. Comparing this to a terrorist act, the editorial has appealed to all ministers to go to Belagavi and shout 'Jai Maharashtra'. “This will not affect their posts as MLAs. Instead, people of the state will appreciate their courage. But no national party will open its mouth on the issue. Because it is about the border and these parties have to save their face on a national level. If the national parties will not come out openly on the issue, who will solve it and how will it get solved?” the editorial asks.